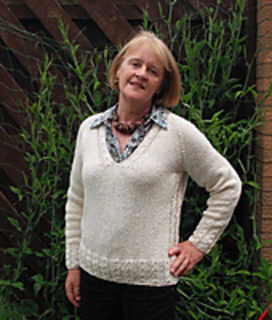 I wanted a quick to knit chunky design that was slimming rather than adding inches, so came up with this sweater with side twisted cable panels to add shaping. 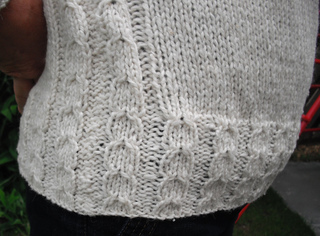 The twisted cable design also outlines the low neckline. 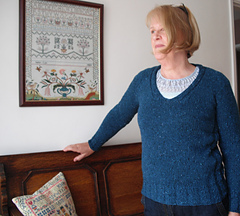 The main pieces are knitted flat to the underarm, then joined and knitted flat to the neck with raglan and front shaping, then finished with a back neck band and with just side and sleeve seaming. As I knit this for myself the pattern is only available in my size (36” bust). 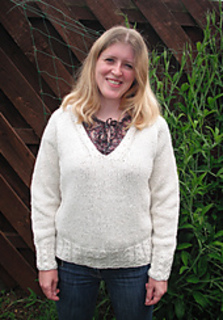 Suitable for knitting in any chunky yarn to match gauge.